Since launching the world’s first desktop mill in 1986, Roland DG has focused on producing 3D milling machines that are compact, easy-to-use and affordable. 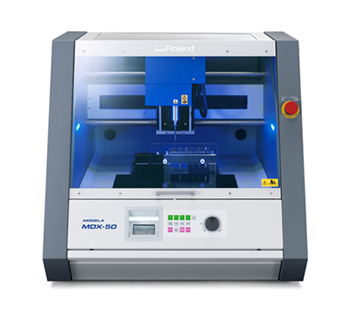 The MDX series has proven popular among engineers, product designers and educators for their ability to quickly and easily produce precision prototypes, parts, jigs and models from a wide variety of resins and woods such as ABS, POM, nylon, plastic foam, modeling wax, chemical wood, hardwood and more. With the increasing number of students and individuals undertaking fabrication for the first time, the MDX-50 has been designed to be both easier and safer to use. The integrated control panel of the benchtop MDX-540, a high-end model of Roland DG’s 3D milling machine, has been added to the front panel of the MDX-50, allowing spindle rotation and milling speed to be controlled while monitoring machining conditions. The on-screen computer operation “VPanel” provides machine monitoring capability, sends emails when machining work is complete or if intervention is required, and records tool usage time and replacement intervals, all of which helps to manage workflow. The SRP Player CAM software bundled with the MODELA series is included. Machining conditions can be configured easily in five simple and intuitive steps, making production simple, even for first-time users. A full cover prevents waste from scattering and an integrated tray collects dust and debris.